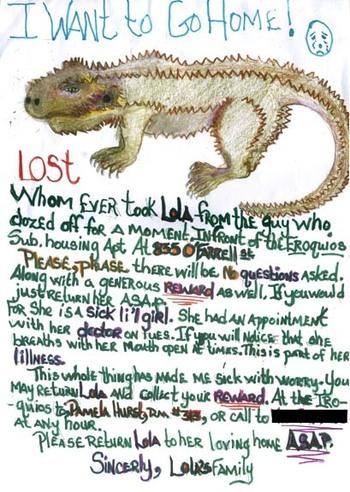 Has anyone seen this small reptile wandering the streets of the Tenderloin in San Francisco? Her co-owner fell asleep on the sidewalk, Lola made her escape, and now the other co-owner is worried sick about her. I found this poster as I walked to a gallery opening one night. My favorite part is the little blue crying face at the top. 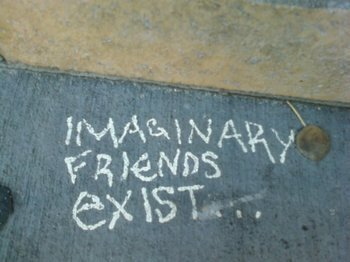 If the sidewalk says so, then who am I to doubt? 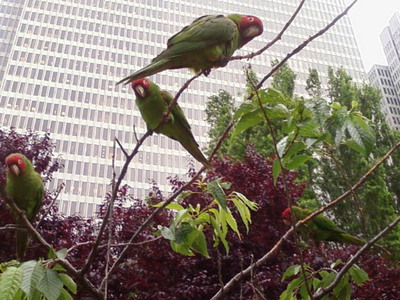 There is a huge flock of wild parrots living in SF. Every day around 4:00pm, the flock congregates at a waterfront park in the middle of the city to roost for the night. I'm now addicted to walking downtown to see these little guys. They are so sweet and will fly over and sit on your head and shoulders if you feed them sunflower seeds. As an added bonus, they'll poop on your clothes too. Everytime I walk down Post Street into the City I see this shy little lion tucked away into the door. This time I had a camera. This little dog is so sweet and so shy and he sits in a doorway and waits for his owner to load up the car after a days's work. Everyone who walks by stops in their tracks to ohh and ahh over this sweet little lion dog. The Three-Headed Tibetan Bat Flower is an extremely rare and unusual plant/animal hybrid. This nocturnal vine is only found in a remote Himalayan valley and is guarded by a tribe of nomadic Yak dieties. 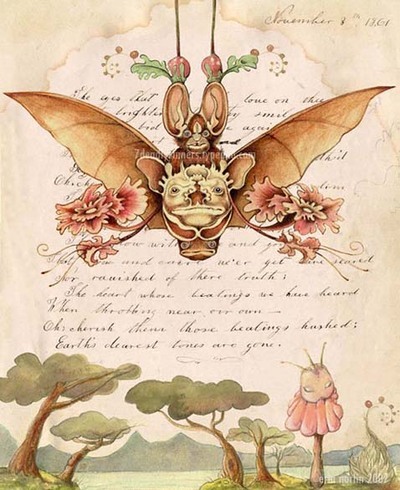 The Three-Headed Tibetan Bat Flower produces spectacular seed pods that drop to the ground and sprout in early Spring (shown at bottom right of illustration). I turned the corner and there he was. 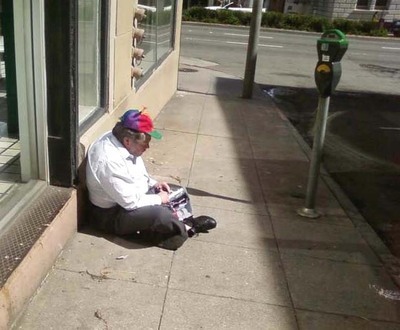 He sat slumped and sullen on the sidewalk, his eyes focused downward, the weight of the depressing world closing in on him, and yet...a cheery rainbow-colored hat sat jauntily atop his head, the little propeller spinning gleefully in the wind. This photo is part of my new documentary series, Stuff You Find on the Sidewalks of San Francisco. 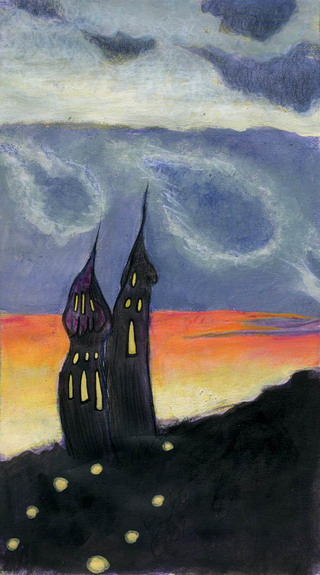 There was a spectacular sunset seen from my studio window the night of November 24, 2006. Oil pastel, ink and wine on paper. Important Basic things to know in life. 4. 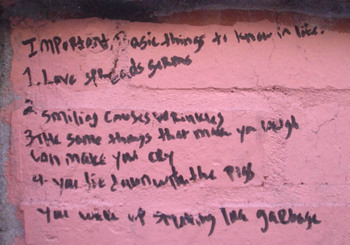 You lie down with the pigs, you wake up smelling like garbage. 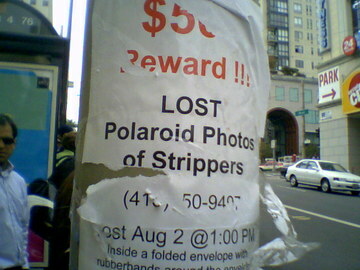 This guy is offering only $50 dollars for the return of a stack of polaroid photos of strippers all held together with a rubberband. If I found such a treasure on the street, the reward would have to be far heftier for me to consider returning to the rightful owner. Poster spotted at Post and Van Ness in San Francisco. I was overwhelmed at the amount of artistic landfill stuffed into Stephen's House. Every available molecule in his home was crammed with so many intriguing trinkets and assorted moldy dead things, there was no place to sit down. Interestingly, there's no bread (or food for that matter) in his kitchen, but there's about 150 antique toasters....and it's unclear if any of them actually work. Once you get over the fact he's got a stuffed two-headed calf in his living room, you'll soon make your way to his bedroom. This is where he showcases the deformed fetuses floating in jars of formaldahyde artfully displayed near his bed. I asked eligible bachelor Stephen what the ladies thought of this particular choice of decor, and he is quite confident the woman for him will be fine with it. I left the 3 hour tour of Stephen's house completely discombobulated, sneezing, awed and inspired, but unsure of what I would paint for the upcoming show. Since he already has everything under the sun crammed into that house, I figured I would create objects that WEREN'T there. 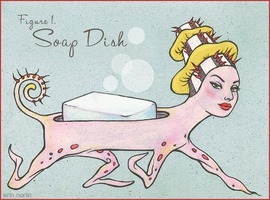 Stephen does not own a Macedonian Mobile Soap Dish, but he sure wishes he did. 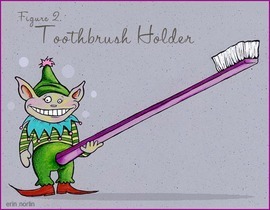 Stephen does not own a Tricky Little Imp Toothbrush Holder like this either. When I asked if he wanted one, he was visibly shaken. "No, no" he said, "that's not the kind of thing I'd be comfortable having in my bathroom."